Last Updated: March 19, 2019 · Published: April 4, 2016 By: Asian Caucasian Leave a Comment This post may contain affiliate links or sponsored content. One day, when I was feeling very lazy, I picked up a prepared meal in the Whole Foods meat department. It happened to be very tasty and inspired me to recreate it with my own twist. 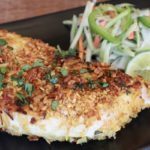 So, here it is — my version of Crispy Coconut Chicken Breasts! It’s both crunchy and tender with tremendous flavor in the crust. Serve it with a side of Spicy Fennel and Broccoli Slaw and you have a light, delicious, home-made meal! Preheat oven to 400 degrees. In a medium shallow dish, combine panko crumbs, shredded coconut, and all spices. Mix well. In another shallow dish, whisk together egg and egg white. Generously salt & pepper each chicken breast on both sides. Dredge each chicken breast into egg, then dip each piece into panko bread crumb mixture, shaking off the excess. Heat an oven-proof skillet with canola oil on medium high. Brown chicken on both sides in pan for about 3 minutes. Remove from stove. Lightly spray the tops of chicken with cooking spray. Place pan with chicken in the oven. Bake in the middle rack for 20-25 minutes until crispy and golden. When ready, immediately plate and top with chopped cilantro and squeeze of lemon juice. Serve with a side of Spicy Fennel and Broccoli Slaw. Note: If you don’t have an oven-proof skillet you can transfer the chicken to a baking tray sprayed with cooking spray. Inspired by Whole Foods Thai Curry Chicken Cutlets.